distant galaxy Centaurus A, which is located about 12 million light-years away from Earth. By observing the black hole’s X-ray emissions as it gobbles material from its surrounding environment, the scientists determined that it is a low-mass black hole, one likely in the final stages of an outburst and locked in a binary system with another star. The object is typical of similar black holes inside our Milky Way galaxy, but the researchers’ observations suggest that this is the first time that a normal-size black hole has been detected so far beyond the vicinity of our home galaxy. The researchers used NASA’s orbiting Chandra X-ray Observatory to make six 100,000-second long exposures of the galaxy Centaurus A. Their observations detected an object with 50,000 times the X-ray brightness of our sun, but a month later, it had dimmed by more than a factor of 10. Later, it had dimmed even more, by a factor of more than 100 to become undetectable, the researchers explained. 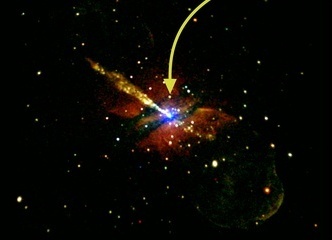 This type of behavior is typical of similar black holes in the Milky Way, but also indicates that the object is likely in the final stages of an outburst. Scientists estimate that there may be millions of these low-mass black holes distributed throughout every galaxy, but they are hard to detect because they do not emit light. Astronomers detect them by observing activity around them. However an overwhelming majority of black holes remain undetected. In recent years, researchers have made some progress in discovering ordinary black holes in binary systems. Scientists look for the X-ray emission produced when they siphon material from their companion stars. Astronomers hope that this new discovery gives them the opportunity to characterize the population of black holes in other galaxies. The team now plans to examine more than 50 other bright X-ray sources within Centaurus A to either identify them as black holes or other exotic, luminous objects.